Rotator Cuff Injuries Handout | Dr. Thomas Trumble, M.D. The rotator cuff is a powerful group of three muscles are essential for normal shoulder motion. A fall, sudden movements or repetitive activities can cause a tear of the muscles. Pain: RTC injuries often cause an aching pain that radiates down the side of the shoulder especially at night. Weakness: Patients often find weakness and pain when trying to do overhead activities. The three muscles are the subscapularis, supraspinatus and the infraspinatus. 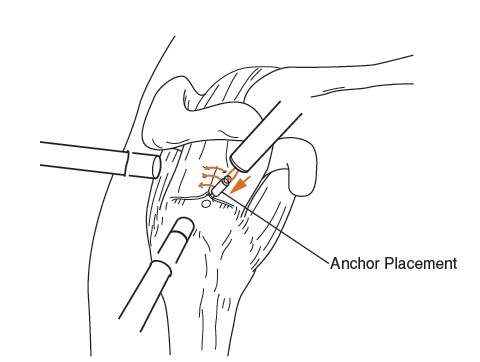 In addition to showing the placement of the arthroscopy portals, Figure 1 shows the way the muscles wrap around the head of the humerus to control rotation. Who has Rotator Cuff Injuries? Rotator cuff injuries can occur after a fall or during sports injuries. Repetitive injuries with heavy lifting can cause rotator cuff tears with the highest incidence between ages 50-­‐60 years old. How do we diagnose Rotator Cuff Tears? 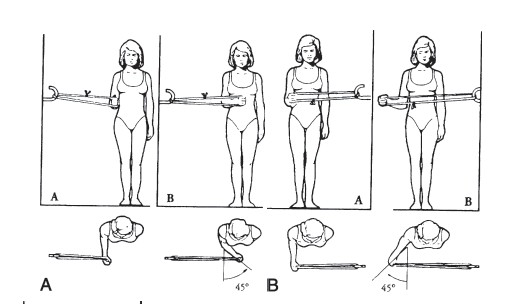 On clinical exam the patients demonstrate a positive ‘empty can test’ where the motion of reaching across their body and ‘dumping’ and empty can upside down produces pain. X-­‐rays are frequently negative but MRI (magnetic resonance imaging) is an excellent test to identify RTC tears. How do we treat Rotator Cuff Tears? Small partial thickness tears can be treated with a therapy program (Figure 2). Medium sized tears can be repaired effectively using arthroscopic surgery. Larger tears or recurrent tears may require open surgery. The patients are seen by a physical therapist two to three days after surgery. After surgery, patients are placed in a splint or brace that prevents stress in the shoulder. They also begin a therapy program that works to increase range of motion without stressing the surgical repair. Although patients do regain most of their motion by three months, full recovery may not occur for over one year.